BabyBlueOnline: U2: Back on the Road! U2 opened the first show of their European summer tour, at Olympic Stadium in Turin, Italy, with the unknown and the familiar. The first song was a brand new, unfinished number, "Return of the Sting Ray Guitar." It was so new it didn't have a real ending — the band just stopped playing after four minutes of a hard pneumatic groove, driven by the Edge's crunching-fuzz guitar. 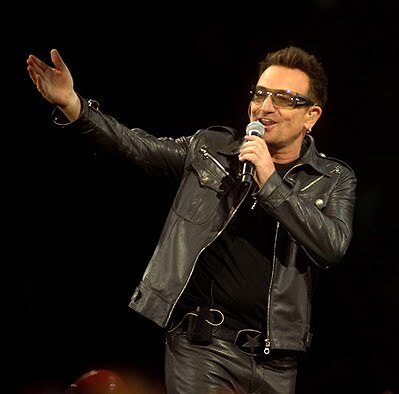 But that riff and power came with a reassuring sight: Bono, on stage for the first time since he underwent spinal surgery nine weeks earlier, strutting along the whole outer rim of U2's giant stage. He often stopped to do boxing-dance moves, throwing punches like a fighter happy to be back in the ring. Bono's restored energy was dramatic confirmation that U2's world tour, now set to run into next year, was only interrupted, not derailed. But the band took that extra time to change the show in profound ways. U2 are still travelling with the most extravagant hi-tech spectacle in stadium-rock history. But they have made the set list less about their last album, No Line On the Horizon, and more about continuing history. Of the 24 songs in the set, three were revived from deep in the catalog: "In A Little While," from All That You Can't Leave Behind; "Miss Sarajevo," from The Passengers album; and the Batman Forever movie theme "Hold Me, Thrill Me, Kiss Me, Kill Me." 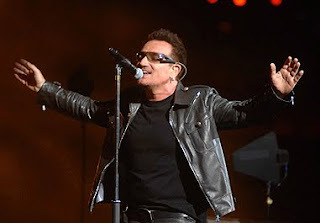 Bono and the Edge also debuted an acoustic ballad "North Star" in complete darkness, illuminated only by the cell phone lights of the crowd. "Let's see if we can turn this place into the Milky Way," Bono said. The crowd came close. And U2 finally got to play the song they had written especially for their aborted June show at the Glastonbury festival. Simply called "Glastonbury," it was another furious package of Bono's wailing, the Edge's rudely distorted guitar and the stern forward drive of drummer Larry Mullen, Jr. and bassist Adam Clayton. The third running theme throughout the night — with liftoff and rebirth — was gratitude. For every leap in the air and bout of shadowboxing, Bono expressed relief and thanks. The blessings and wonder in "Beautiful Day" were repeated again and again in his voice and lyrics, in "Magnificent," "Get On Your Boots," "City of Blinding Lights" and the final encore, "Moment of Surrender." Early in the set, after "Mysterious Ways," Bono stopped to introduce his bandmates and thank them for "their strength and patience." He also told the crowd how much he appreciated the letters and best wishes from fans during his recovery. But he added, "that time is past. We're very much for the future." Then Bono led U2 into a stirring charge through the Joshua Tree song, "I Still Haven't Found What I'm Looking For." He sang it like he's ready to go the distance.